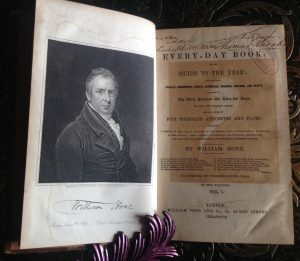 William Hone’s The Every Day Book, published in 1825, includes news from Hitchin on 1st May 1823 describing a curious May Day custom. “Between three and four in the morning a large party of townsfolk paraded through the town singing The Mayer’s Song and carrying large branches of May. They fixed these branches in the handles or knockers of the doors of every respectable house in town, the more respectable the house the larger the branch. However, if a servant of the house had offended one of the Mayers a branch of elder and nettles was fixed to the door instead, which was considered a great disgrace. As a result, the servant girls rose early to see what May-branch they’d been given. Throughout the day, parties of Mayers danced and frolicked in various parts of the town. The writer describes a group which remained in Bancroft, and another in Sun Street, for over an hour, each consisting of two men with faces blacked, one with a birch broom and a large artificial hump on his back, the other dressed as a woman in rags and tatters, with a large straw bonnet and carrying a ladle. These were called “mad Moll and her husband”. Next came two men, one dressed fantastically with ribbons and many gaudy silk handkerchiefs round his arms and legs. He carried a drawn sword in his hand. Leaning on his arm was a youth dressed as a fine lady in white muslin, profusely bedecked from top to toe with bright ribbons. This couple were the “Lord and Lady”. Six or seven more couples followed, dressed much like the Lord and Lady but without swords. When the group had received a satisfactory contribution at any house, musicians struck up a tune on a violin, clarionet, fife and drum and a merry dance began. “And very well they danced, I assure you”, says the writer, though he was relieved to be assured that all the group were in fact men, as women were not permitted to take part. While the group danced merrily around, mad Moll and her husband amused the crowds with grimaces and clownish tricks. If the onlookers pressed too close, mad Moll’s husband went to work with his broom, sweeping the road dust into the faces of the crowd. When onlookers offered pretended affronts (and many did) to his wife he chased them, broom in hand, and if he couldn’t catch them he flung his broom at them. This caused “an abundance of merriment”. We have brought you a branch of May. There is more information about the origin and variations of The Mayers Song in the book “The Mayers and their Song, or some account of The First of May and its observance in Hertfordshire” by W.B.Gerish, published early 20th or late 19th century. He found nine versions of the song, the earliest dating from Elizabethan times. Thanks to the Emmitsburg Area Historical Society of Maryland, USA for making the Book of Days available online, and to Kyle Grimes of the University of Alabama at Birmingham for the same service with William Hone’s Every-Day Book.